An armed robber who stole £3,000 in a supermarket raid escaped in a stolen car which was later found burnt out, detectives have revealed. They have revealed more details about the armed robbery at the Co-op, High Street, Ecclesfield, after an earlier statement released by the force. 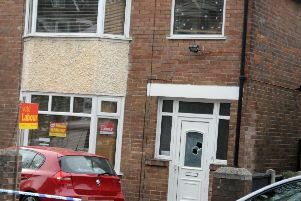 A masked man armed with a machete forced staff into a rear room at the store, where the safe is kept, and escaped with £3,000 during the raid at 5.50pm yesterday. Detectives said the robber drove off from the scene in a silver Vauxhall Corsa, which is believed to have been stolen from the High Green area the night before. The car was later found burnt out in Shiregreen. Detectives said the robber was wearing a blue ski mask or balaclava, a blue hoodie, grey jogging bottoms and was carrying a Sainsbury's bag. They want to hear from anyone trying to change a large number of coins. A South Yorkshire Police spokesman said: "Police are investigating following reports of an armed robbery at a shop in Ecclesfield yesterday evening. "Just before 5.50pm a man entered the Co-op, in High Street, carrying what is described as a machete. "He made demands for money before leaving via the back entrance of the shop with a quantity of cash and getting into a silver Vauxhall Corsa, thought to have been stolen the previous evening from the High Green area. "No one was injured during the incident but staff members were understandably left incredibly shaken." Anyone with information should call South Yorkshire Police on 101 or Crimestoppers on 0800 555 111, quoting incident number 756 of January 21.